Four bikes in one, each just a click away, ensuring the motorcycle adapts perfectly to both the terrain and your riding style. The standard version of the Multistrada 1200 combines the outstanding performance of the new Testastretta 11° DS engine with sophisticated Ducati Safety Pack technology and unmistakeable Ducati instinct. The range signals the latest stage of the Multistrada adventure with a long list of fascinating and high-tech features that continue the model’s reputation for industry-changing innovation. They include the second generation Testastretta 11° DS engine and the Bosch ABS 9ME braking system with full Riding Mode integration. Combining ground-breaking design and unprecedented technology, the Multistrada’s Sport, Touring, Urban and Enduro Riding Modes enable a truly enjoyable and customisable riding experience separated by just one click. The four-bikes-in-one concept makes instant adjustment to power and torque delivery in addition to electronic adjustment of suspension settings, traction control, ABS and Ducati Skyhook Suspension, instantly transforming the Multistrada 1200 to suit its rider and environment with even more precision. Hailed as a true ‘game-changing’ motorcycle, the Multistrada 1200 has attracted all types of riders by removing the borders between motorcycle categories. With the latest 150hp Testastretta 11° DS engine, a class-leading dry weight of just 194kg (428lb)* and the application of advanced ergonomics, the Multistrada 1200 is not only powerful and playful, but also a comfortable and versatile adventure on two wheels. The eight-level DTC and new three-level ABS introduce the Ducati Safety Pack (DSP) concept to the Multistrada family, further underlining Ducati’s focus on performance safety. The ‘S’ versions of the Multistrada 1200 are equipped with electronic 48mm Sachs front forks and rear single shock, both featuring the new Ducati Skyhook Suspension (DSS) system. The innovative technology features a semi-active suspension management that constantly re-adjusts damping to maintain optimum vehicle composure – as if the motorcycle was suspended from the sky. The innovative system removes the compromise of conventional, passive suspension by continuously re-evaluating the dynamic relationship between the wheel following the road surface and the comfort provided by a constantly steady vehicle body. With the intelligent DSS system, many of the negative attributes of a soft or hard set-up are eliminated without compromising performance in the environments for which they were intended. DSS uses data delivered from a number of sensors situated both on the “sprung” and “unsprung” sides of the chassis to calculate and provide the smoothest possible operation. Vertical accelerometers situated on the front lower triple-clamp and in the rear sub-frame deliver “sprung” data, while additional sensors on the front fork leg lower and rear swingarm – close to the wheel hubs – deliver “unsprung” data. DSS then uses an algorithm in its programming which considers an imaginary fixed reference point above the vehicle: “a hook in the sky”. The system then responds to the inputs of both the vehicle and wheel movements with instantaneous damping adjustments to help maintain a constant relationship between the Multistrada and the reference point, providing optimum vehicle equilibrium and a smoother ride. To smooth-out the longitudinal forces created by braking and acceleration/de-acceleration, the system employs the Ducati Traction Control (DTC) longitudinal accelerometer sensor and the new ABS pressure sensors to instantly calculate and execute a response that will reduce the positive and negative pitching effect subjected to the vehicle. DSS works by instantly calculating all relevant data and responding with immediate adjustment of the compression or rebound damping appropriate to the current Riding Mode. The resulting increase or decrease in damping significantly reduces the magnitude of force generated when riding over uneven terrain or when braking, accelerating or de-accelerating, enhancing motorcycle stability and considerably increasing comfort for both rider and passenger. Normal suspension adjustments to rebound and compression damping and rear spring pre-load are automatically integrated with the Multistrada’s Riding Modes and can be further personalised by entering a user-friendly control panel in the instrumentation. In addition to the Riding Mode of Sport, Touring, Urban and Enduro, there is also an option to quickly change the suspension setting to suit ‘rider only’, ‘rider with luggage’, ‘rider and passenger’ or ‘rider and passenger with luggage’. DSS recognises any personalised settings as its new “zero point” and reconfigures itself ready to interact. As an integral part of the Ducati Safety Pack (DSP), the Multistrada 1200 is equipped with the very latest Bosch ABS 9ME controlled Brembo braking system, an unbeatable combination of state-of-the-art security and track-proven power. Shorter stopping distances with enhanced stability are vital prerequisites, whether for Sport or Touring, but add full Riding Mode interaction to the set-up, and the latest system enables zero-compromise performance for Urban and Enduro also. Using the same processor that controls the ABS of the 1199 Panigale Superbike, the Multistrada provides an optimised front-to-rear combined braking system in Urban and Touring Riding Modes, instantly adjusted when operated in Sport and Enduro Riding Modes, riding environments in which a less automated control is normally preferred. The stability-enhancing front-to-rear combined braking feature uses four pressure sensors – one in the front and rear master-cylinder and one in the front and rear calliper circuit – to precisely understand the vehicle’s braking performance and provide an additional and optimised braking pressure on the rear when the front brake is applied. Underlining its similarity to the 1199 Panigale, the ABS system also enhances control by maintaining optimum ground contact for the rear tyre during severe braking with a rear-end anti-lift feature in addition to providing ABS function on the front brakes only in certain conditions. 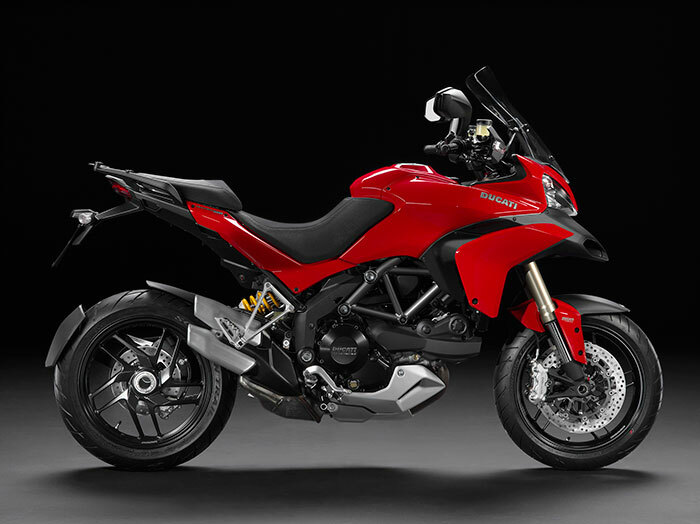 The system integrates perfectly with Ducati’s four-bikes-in-one Riding Mode concept by dividing its features into a three-level operating system. Level two provides an appropriate combined front/rear balance and no lift-up detection for Sport riding, while level three delivers optimised combined braking with lift-up detection to provide the maximum security management for Touring and Urban use. Level one provides maximum performance for off-road use, removing lift-up detection and enabling the rider to drift the rear-end under braking with a pre-set number of seconds of front only ABS. The front brakes use twin radially-mounted Brembo four piston, two pad callipers actuated by a master cylinder with an adjustable lever. The fronts grip 320mm discs, while a single 245mm disc on the rear is gripped by a single Brembo calliper. Typical of all Ducatis, these components ensure high performance braking and set the standard in this segment. All 2014 Multistrada models are fitted with the Bosch-Brembo ABS system as standard equipment, delivering outstanding braking performances in all conditions and providing a major contribution towards performance safety. An option to disable the ABS in each individual Riding Mode is available via the instrumentation, and the system allows the setting to be saved and memorised at the next ignition-on. The second generation Testastretta 11° DS engine introduced a number of important and highly effective enhancements, increasing torque to 12.7kgm (91.8lb-ft) and overall mid-range power delivery with even smoother operation. The improvements perfectly complemented the Multistrada 1200 by using a combination of new technologies proven on the 1199 Panigale’s Superquadro engine, and established technologies reintroduced to further enhance the overall package. The Testastretta 11° DS’s fuel injectors target spray directly onto the rear of the hot intake valve instead of the relatively cold surface of the intake port wall. The enhanced vaporisation achieved as the fuel hits the valve, fully atomises the incoming charge, eliminating the chance of compromised combustion efficiency experienced if droplets of fuel enter in liquid form. The second generation engine introduced a secondary air system, ensuring performance-optimised fuel mapping for smoother cycle-to-cycle engine operation, without compromising emissions and reintroduced the concept of Dual Spark (DS) with two spark plugs per cylinder-head providing a twin flame-front for complete and efficient combustion across a shorter period of time. First introduced for the Multistrada 1200 in 2010, the Testastretta 11° engine effectively took the fire-breathing 1198 Superbike power plant and re-engineered it with increased user-friendliness. Engineers achieved this to great effect by reducing the amount of valve over-lap from around 41° – typical in performance engines that operate constantly at high RPM – to just 11°, which reduced peak horse-power slightly, but enhanced mid-range and overall smoothness – classic prerequisites for touring. The overlap angle is defined as the interval of crankshaft rotation, measured in degrees, during which both the intake and exhaust valves are open at the same time. This overlap occurs between the end of the exhaust stroke and the start of the intake stroke. On the Testastretta 11° engine, this angle has been reduced and the fresh inlet charge flow less compromised by the exiting exhaust gases, resulting in a much smoother combustion, improved fuel economy and lower exhaust emissions. Unburnt hydrocarbon emissions (pre-catalyser) and specific fuel consumption (and consequent CO2 emissions) are considerably reduced. With 150hp and 12.7kgm (91.8lb-ft) of torque, the Testastretta 11° DS set a new standard for Ducati twin-cylinder engines. Constant attention to every last detail enabled Ducati to achieve an excellent torque curve at low rpm, which remains strong through a wider range, further enhancing the Multistrada 1200’s effortless ridability. The Multistrada 1200 engine features an oil bath clutch with ‘slipper’ function and super-light feel at the lever. Its design uses a progressive self-servo mechanism that presses the plates together when under drive from the engine, enabling the reduction of the clutch spring rates. This results in a much lighter clutch lever at the handlebar, ideal in stop-start traffic or long journeys. When the drive force is reversed (over-run), the same mechanism reduces the pressure on the clutch plates, enabling them to provide a race-like ‘slipper’ action, which reduces the destabilizing effect of the rear-end under aggressive down-shifting and provides a much smoother feeling when closing the throttle or down-shifting under normal riding conditions. The simple and minimalistic layout for the exhaust system uses two primary manifolds flowing directly into the triple chamber single silencer. In addition to carrying out the 2-1-2 compensator function, the silencer contains the catalyser and sound-absorbent materials. The two compact and lightweight aluminium alloy end pipes depart in a low, lateral configuration to keep the overall weight to a minimum. Constant investment in quality by design, advanced materials and engineering techniques, has enabled the distance between major service intervals (valve clearance check) to be set at an owner-friendly 24,000km (15,000 miles). This has been achieved partly by the introduction of a new valve seat material and partly by the improved combustion efficiency and temperature management designed into the Testastretta 11° DS engine. Ducati’s four-bikes-in-one concept is achieved by selecting from a choice of four pre-set modes programmed to instantly change the engine character and chassis set-up of the Multistrada 1200 – even while riding. The four modes are made possible by combining a number of class-leading technologies. 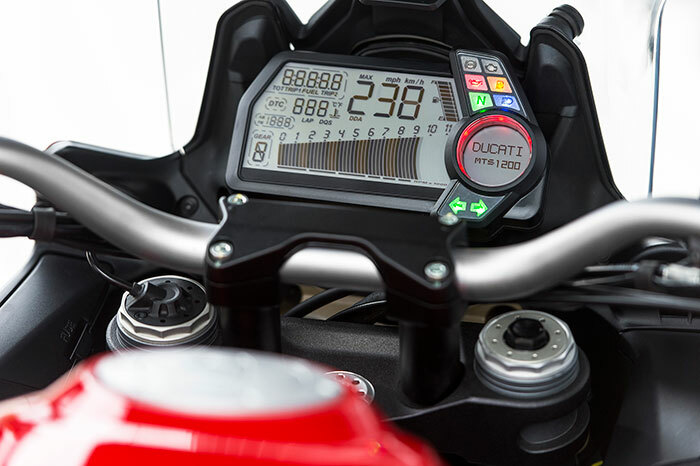 An electronic Ride-by-Wire (RbW) system administers different mappings to regulate power delivery by interpreting the rider’s throttle input, while the world-beating Ducati Traction Control system (DTC) uses eight levels of system interaction to enhance control by reducing wheel-spin. For 2013, ABS is also programmed to offer the optimum setting appropriate to the Riding Mode selected and, for the ‘S’ versions, Sachs electronic suspension front and rear not only configures the suspension set-up with Riding Mode-appropriate electronic adjustment, but Ducati Skyhook Suspension (DSS) now also instantly reacts to additional inputs to maintain overall vehicle composure for a smoother ride. The Sport Riding Mode provides the rider with an adrenalin-fuelled 150hp ride with a sport-oriented throttle response and, on the ‘S’ versions, an instant high performance suspension set-up with DSS reconfigured to provide appropriate active management in this mode. In character with its Superbike heritage, the sport mode also changes the DTC system intervention to level four for expert riders and ABS to level two for a performance-oriented interaction with combined front/rear function slightly reduced and “lift-up” detection deactivated for those whose ‘comfort zone’ is a little closer to the limit. The Touring Riding Mode is also programmed to produce 150hp, however, the power characteristics are designed in a touring configuration with a smoother, more user-friendly delivery. Active safety is enhanced by increasing DTC system intervention to level five, specifically intended for an enjoyable and relaxing ride and ABS to a touring-oriented level three interaction for maximum confidence with “lift-up” detection active and combined braking optimised. On the ‘S’ versions, the suspension automatically dials-in a set-up ideal for long distance touring, ensuring maximum comfort for both the rider and passenger and DSS again reconfigured to provide appropriate active management, even considering the amount of load onboard pre-programmed into the system by the rider. As an urban environment often requires an even more user-friendly motorcycle, the Urban Riding Mode instantly transforms the Multistrada 1200 into the most manageable, everyday transport. Power output is reduced to 100hp, and the suspension, on the ‘S’ versions, to a setting perfect for tackling the maze of city streets full of speed bumps and drain covers. Once again, DSS is also reconfigured to provide appropriate active management in this demanding environment. DTC is further enhanced to level six to provide high system intervention during the most chaotic of stop-start traffic and ABS to a city-oriented level three interaction for maximum confidence with “lift-up” detection active and combined braking optimised. If adventure invites the Multistrada 1200 off the beaten track, it has the capability to take off-road routes in its stride. Agile and lightweight and with high, wide handlebars, serrated footrests and specially designed tyres, the Multistrada also features an Enduro Riding Mode which instantly produces a smooth 100hp engine, immediately dials-in an appropriate suspension setting on the ‘S’ versions and reconfigures DSS to provide appropriate active management. The DTC system is reduced to level two for minimal intervention and ABS to an off-road-oriented level one interaction for a low-grip terrain appropriate setting with “lift-up” detection deactivated and rear wheel ABS partially interrupted for controlled rear end drifting. The Ride-by-Wire (RbW) system is an electronic interface between the twistgrip and the engine which decides the ideal power response depending on the Riding Mode selected and according to the rider’s throttle input. The twistgrip no longer uses a throttle cable to control the throttle body butterflies, but instead delivers a signal to a control unit, which in turn operates the butterfly opening. The RbW system enables the use of three different mappings to regulate the power delivery. The three maps offer 150hp with a sports-type delivery, 150hp with a progressive delivery suitable for touring and 100hp with progressive delivery for city or off-road use. The racing-derived Ducati Traction Control (DTC) is a highly intelligent system which acts as a filter between the rider’s right hand and the rear tyre. Within milliseconds, DTC is able to detect and then control rear wheel-spin, considerably increasing the bike’s active safety and performance and is an important component of the Ducati Safety Pack (DSP). DTC levels are factory pre-set in each of the four Riding Modes, but can be individually customised and saved to suit the rider by accessing the set-up menu within each mode. A ‘Default’ option is available to easily return all settings to factory pre-sets. The main LCD displays data for speed, rpm, gear, total mileage, trip1/trip2, engine coolant temperature, fuel level and time. When the motorcycle is in motion, the dot-matrix LCD displays the selected Riding Mode, remaining fuel/distance, current fuel consumption, average fuel consumption, average speed, air temperature, trip time, and ‘freezing conditions’ alarm. When stationary, buttons on the left-hand switchgear can be used to enter a setting menu from where adjustments to the various functions can be made including personalised DTC and a three-level ABS set-up. On the ‘S’ versions, suspension settings can be set with a user-friendly five-point graphic that provides two settings “harder” and two settings “softer” than a central “medium” position for both front and rear compression and rebound damping, while digital rear spring pre-load now increases from a 1-16 range to a 1-24. The Multistrada headlight has an LED low-beam illumination in addition to LED position lights and while the main-beam remains conventional, it functions in addition to the LED low-beam to enhance overall lighting efficiency. The Granturismo goes one step further with two LED spot lights enhancing peripheral illumination controlled from a handlebar-mounted switch. A hazard light function on all Multistrada models is activated by holding the left-turn signal button on for four seconds. The Multistrada 1200 ignition is not actuated with a normal key. Instead, an electronic key in the rider’s pocket communicates with the Multistrada when within a distance of approximately 2 metres (6.5ft), recognising the dedicated key code and automatically enabling the motorcycle’s systems. Pressing the key-on switch then activates all systems to ‘on’ and the engine is ready to be started. The original Multistrada 1200 project was subjected to an extensive ergonomic study using both CAD and repeated prototype testing, guaranteeing a high level of comfort with a fully loaded motorcycle for long-range touring. The ‘ergonomic triangle’ of handlebar, seat and footpegs has been designed for both the rider and passenger, optimising comfort while providing a commanding and upright riding position. The machine feels spacious and accommodates both rider and passenger in complete comfort, even with a top case and side luggage in place. Its 1530mm (60.2in) wheelbase ensures that not only the weight of the passenger remains inside the wheelbase length, but also that of the side luggage when loaded, a considerable contribution to the motorcycle’s dynamic performance. Underlining its multi-tasking intention, ergonomic attention was even applied when designing the riding position while standing on the footpegs, off-road style. The wide, tapered steel handlebars have been designed for maximum comfort and ensure a commanding riding position enhanced by a generous steering lock of 76° (38° left and right). In addition, the handlebars have been mounted on anti-vibration isolators, specially designed to balance riding comfort with a precise road ‘feel’. The Multistrada 1200 seat immediately transmits a sense of comfort with generous dimensions front and rear. Constructed in two separate sections for the rider and passenger, the design focussed on form and cushion density to ensure maximum comfort during long journeys and user-friendly lateral shaping to help give sure-footed ground contact when stationary. A confidence-inspiring passenger grab-handle offers a secure and comfortable grip. Two handy onboard stowage areas are built into the motorcycle, one suitable for a mobile phone or toll road tickets situated in the right cockpit panel with a glove-friendly “push-push” lid latch, and an additional three litre area situated under the passenger seat. The Multistrada 1200’s screen provides excellent protection and rider comfort during long distance travel and its 60mm of vertical adjustment can be adjusted using just one hand because of the useful centrally-mounted, pinch-and-slide mechanism. Two 12v power outlets situated on either side of the area below the rider’s seat can be used to power up to 8A (fused) accessories such as thermal apparel, intercoms or mobile phone chargers. In addition, a special connection point for powering a GARMIN satellite navigator (optional feature) is situated near the instrumentation. The Multistrada 1200 S Touring and 1200 S Granturismo add even more comfort and convenience with easily controlled heated grips ideal for journeys where adverse weather conditions threaten rider comfort, and generously proportioned, stylish luggage offering a load capacity of 58 litres (73 litre for the Granturismo) with a fast and secure attachment system that is perfectly hidden when the luggage is removed. In addition, a centre stand provides parking confidence when fully loaded and essential security in the event of tyre maintenance during long journeys. Components that are far more than just aesthetic detail, include the frontal air intakes that characterise the face of the Multistrada and also deliver air to the oil cooler and airbox, and the beautifully formed aluminium sump guard and side plates that help to protect the engine off-road. The Trellis frame uses large diameter, light gauge tubing with two central cast aluminium sections and a Trellis rear subframe to achieve optimum torsional rigidity. The high pressure, die cast, magnesium front sub-frame reduces the high, frontal weight and contributes to chassis feel and control. The standard version Multistrada 1200 uses 50mm Marzocchi front forks, featuring a special forged fork bottom and full adjustability in spring pre-load and compression and rebound damping. The rear is controlled by a Sachs monoshock adjustable in compression and rebound damping and in spring pre-load by using the handy remote manual adjuster. 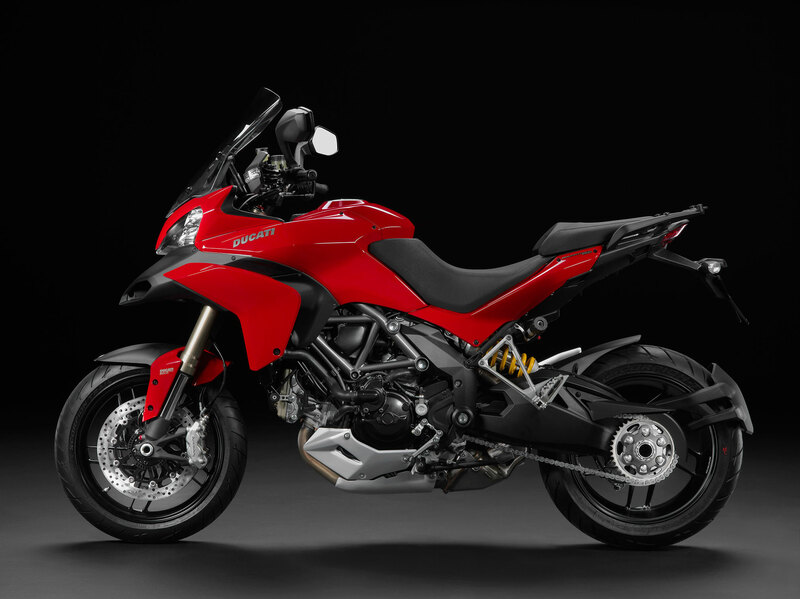 The ‘S’ versions of the Multistrada 1200 are equipped with electronic 48mm Sachs forks and rear single shock, both featuring Ducati Skyhook Suspension (DSS). This innovative development not only enables rebound and compression damping adjustments and rear spring pre-load, automatically adjustable with the Riding Modes or individually adjusted via the instrument panel, but also features a semi-active management that constantly re-adjusts damping to maintain optimum vehicle equilibrium – as if the motorcycle was suspended from the sky. The front and rear suspension of both versions provide 170mm (6.7in) of travel, the extra-long movement ensuring excellent comfort even when fully loaded or if the rider decides to leave the asphalt for off-road routes and all models are equipped with a progressive-rate rear spring, which increases that comfort across a wider range of load conditions. This comfort is also further enhanced with DSS on the ‘S’ versions and an option to easily change the suspension setting to suit ‘rider only’, ‘rider with luggage’, ‘rider and passenger’ or ‘rider and passenger with luggage’ with just a few clicks of a button, providing a fast and convenient way to optimise the Multistrada’s journey performance. 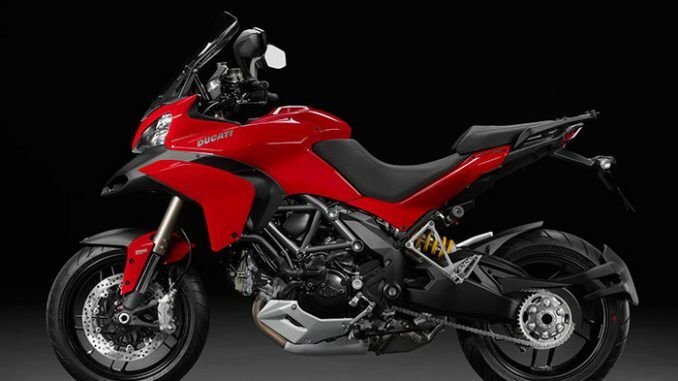 The Multistrada 1200, 1200 S Touring and 1200 S Granturismo all use 1199-style, 10-spoke lightweight alloy wheels, and the 1200 S Pikes Peak rolls on 1199 S-style triple 3-spoke, forged and machined wheels by Marchesini. While all models use 3.50×17 front and 6.00×17 rear sizes and are finished in black, the Pikes Peak wheels carry the signature red pin-striping of Ducati’s sport-oriented wheels. Ducati’s technical partner, Pirelli, worked alongside the Multistrada’s engineers throughout the original Multistrada 1200 project, developing the Pirelli Scorpion Trail tyres specifically for the four-bikes-in-one concept. The tyres used on the 1200, 1200 S Touring and 1200 S Pikes Peak represent the first ever dual compound for on/off road use with a harder compound central section. Combined with a special tread design and carcass structure, their 190/55 section delivers racing performance on the road in terms of grip and lean angles, while ensuring high mileage for touring and good off-road performance. The Scorpion Trail incorporates Pirelli’s latest compound technology, ensuring optimum performance in all conditions, with enhanced longevity. Appropriate to its grand touring intention, the Multistrada 1200 S Granturismo is mounted on Pirelli Angel GT tyres, specifically designed for maintaining optimum performance throughout long distance journeys. Under the title “performance mileage”, Pirelli deeply studied compound and tread pattern data to develop a tyre with a combination of excellent wet weather character and all-round performance, perfectly suited to modern sport-touring, even with full luggage capacity. Multifunction digital dashboard of two displays with white backlight. Main LCD display: odometer (total, trip 1 and trip2), speedometer, rev counter, clock, gear indicator, coolant temperature; fuel level. Circular LCD dot-matrix display: trip computer (riding style set-up, active riding parameters, remaining fuel/distance, current fuel consumption, average fuel consumption, average speed, air temperature, trip time), maintenance intervals indicator (Km), signaling alarms and errors detection (diagnosis), setup menu and customization functions. Interface for the management of Riding Modes (control power curve and throttle response power, traction control, ABS). “Parking” and “Steering lock” indicators. Lights: oil pressure, neutral N, fuel warning, turn signal, EOBD (diagnosis), high beam, DTC intervention (Traction Control) and deterrent immobilizer (in Key-Off). Headlight control: auto switching-off during engine start, auto turning-off after 60 seconds from Key-On without starting the engine. The key management of the various function menus are integrated in the left and right switch controls. *GBP Prices quoted are SRP’s including 20% VAT and the cost of pre-delivery inspection.